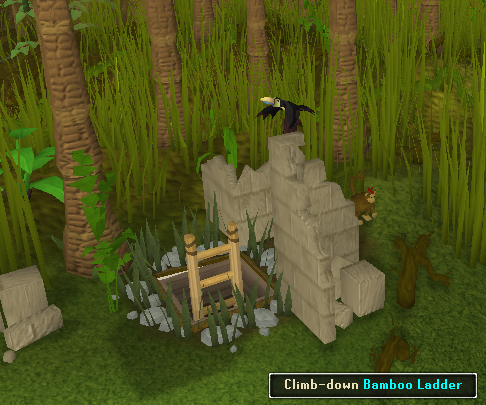 Zooknock's Tunnel, located on the island of Ape Atoll, is a great place to train Ranging by using Chinchompas. 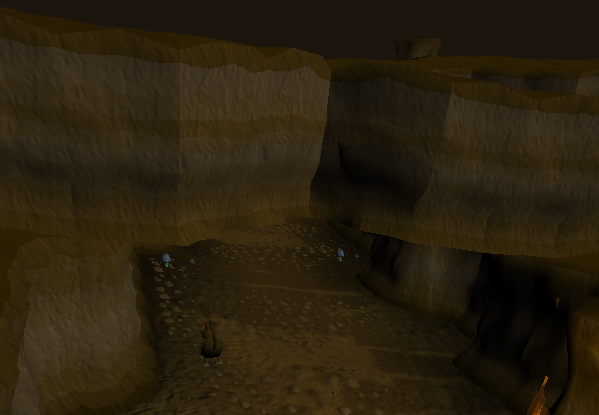 Before traveling here, it is recommended that you complete the quest, Monkey Madness, so you will have a Monkey Greegree to wield. 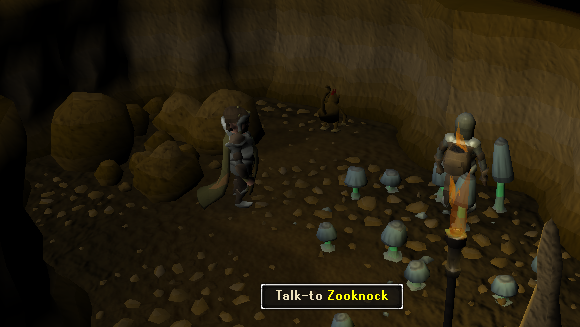 Zooknock, the wizard located at the very end of the dungeon, is a person involved in the quest, Monkey Madness, and will make an M'speak Amulet and a Monkey Greegree for you if you bring him the required materials. 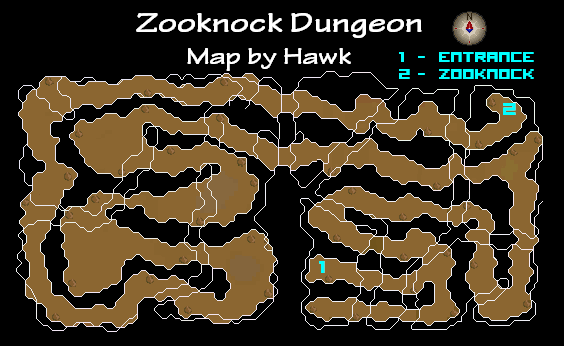 Zooknock Dungeon is located on the southern part of Ape Atoll. To get there, first travel to Ape Atoll by going to the Grand Tree, climbing to the second floor, talking to Daero on the eastern part of the tree, and then getting flown to Crash Island by Waydar. After arriving, speak to Lumdo to take his boat to Ape Atoll. It is then recommended to change into a monkey by wielding a Monkey Greegree before you travel west to the dungeon. 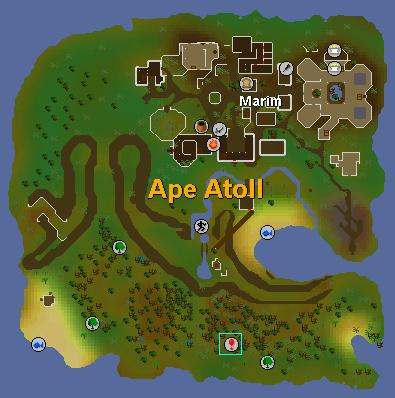 Another way to get there, if you have completed the Awowogei part of Recipe for Disaster is to use the Ape Atoll teleport. It uses two fire runes, two water runes, two law runes, and one banana. This will teleport you to the monkey temple in the east part of the city. Walk west to the gate, then southeast until you reach the entrance. It is recommended that you always carry a Monkey Greegree with you while on Ape Atoll. To get a Monkey Greegree, buy a Monkey Talisman from Tutab's Magical Market in the city on Ape Atoll. Then kill any monkey, either on Ape Atoll or Karamja. Bring these both to Zooknock and he will make a Monkey Greegree for you. The Super Energy Potions (4) are too let you run the entire way through. The Monkey Greegree protects you from being attacked by the monsters. The Plank lets you cross one of the traps described below. The Falador Teletab, which can be exchanged with any teleport that you prefer, lets you escape in a tight situation if you need to. The Antipoison (4) is in case you get poisoned. A Super antipoison may be a good replacement. Make sure to take good food, at least lobsters. 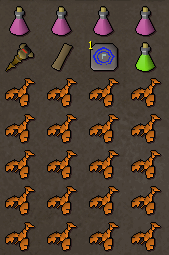 If you have level 52 Summoning, take a Spirit Terrorbird pouch with Tireless run scrolls. To simulate this effect, after the As a First Resort quest, you unlock a mineral pool that will allow you to run for a limited time while barely losing any energy. The recommended equipment is mainly made up of Prayer boosting equipment, and the Boots of Lightness and Spotted Cape to lighten the load so you can run longer without taking a rest. The reason you want a prayer boost is if you do not plan on carrying a Monkey Greegree. 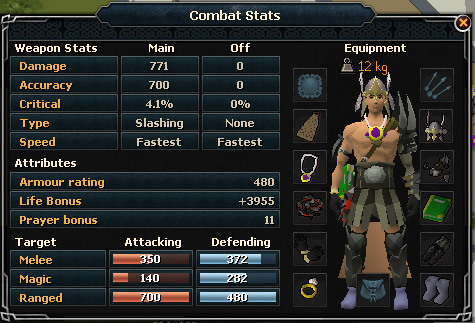 Use the "Protect from Melee" prayer to be protected from 50% of the damage. The Ring of Life is in case you almost die in the dungeon. It will teleport you out if you have less that 1/10 of your maximum Life Points. 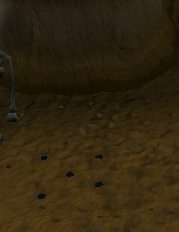 An Explorer's Ring from the Lumbridge task system will replenish your run energy a few times per day. Another substitute for the gloves are Penace Gloves, which lessen the weight you are carrying. Once you enter the dungeon, immediately head east to seek cover under the closest rock bridge as seen in the picture below. This is to protect you from the falling debris that will constantly damage you if you are not protected. Whenever the screen starts shaking, some will fall down. If you are not a wielding your Monkey Greegree, you will be attacked by every creature in the dungeon. 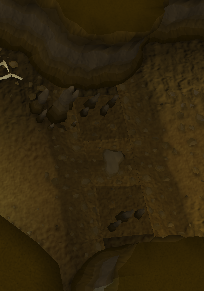 Along the paths, you might run into a few traps. 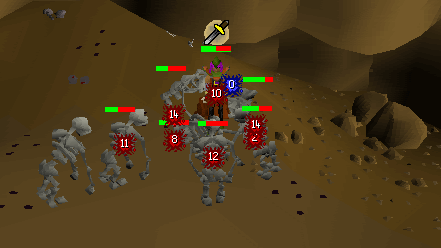 Many people train in this dungeon with Red Chinchompas because the Skeletons spawn and when you kill them, their bones grow into new Skeletons. With many Skeletons, they can get great Ranging experience with the explosions from the Red Chinchompas. Some people also use the Ancient Magicks spell, Ice Barrage, which requires 94 magic to use. It also affects the monsters in a 9x9 square and can deal up to 30 damage. Just walk around the spike traps to not get hurt from them. These traps will also poison you. Use a plank with the circle on the ground in order to walk across the floor trap safely. These traps will also poison you. This is Zooknock, the wizard who will make you Greegrees and M'speak Amulets. His two aides, Waymottin and Bunkwicket, are working on digging a tunnel towards the jail. If you have lost your 10th Squad Sigil, speak to Waymottin to get a new one. For him to make you an M'speak Amulet, bring him Monkey Dentures and a gold bar. He will combine them. Then, take the M'speak Amulet Mould and the Enchanted Bar to the flame walls under the temple in the east part of the city. Use the Enchanted Bar on the flame wall and then string the amulet with a ball of wool. The Monkey Dentures can be bought from the Tutab's Magical Market. For him to make you a Monkey Greegree, bring him a Monkey Talisman and some monkey bones. The Monkey Talisman can be bought from Tutab's Magical Market for 1,000gp. The bones can be from any monkey. 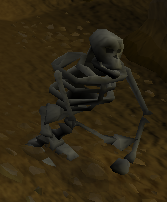 When you wield the Greegree, you will gain the appearance of the monkey of which bones you gave to Zooknock.